The Nigerian Prisons Service has apprehended a suspected job scammer, James Odey, for allegedly issuing fake letters of appointment to unsuspecting job seekers in the Federal Capital Territory, Abuja. Before his arrest, Odeh was said to have issued about 400 applicants with fake appointment letters into the Nigerian Prisons Service. The Prisons Service Public Relations Officer, Francis Enobore, said 31 victims had besieged the National Headquarters of the Prisons Service with fake letters of appointment for documentation last Friday. He said investigation indicated that the victims were duped by the suspect and his gang members, who posed as members of “Replacement Board” of the NPS. Some of the victims claimed to have parted with between N100,000 and N500,000 before they were issued the fake letters of appointment. Enobore said the 31 applicants with fake appointment letters and Odeh had been handed over to the police for further interrogation and prosecution, while the search for other members of the syndicate continued. “The public is hereby advised to beware of fraudsters on the prowl, who take undue advantage of the congested labour market to inflict further pains on unsuspecting job seekers,” he added. Meanwhile, the Akwa Ibom State command of the Nigerian Immigration Service has arrested a 40-year old pastor, Victor Udom, for defrauding one of his church members, Mr. Eyo Akpan, of N500,000. Udom, a prophet of Eternity Mission Church, Udo Uweme, Uyo, was said to have collected N270,000 from Akpan to secure a job with the NIS for his daughter, Miss Magdalene Akpan. The state Controller, NIS, Abdullahi Garba, said Magdalene brought an appointment letter which Udom had prepared for her to start work in the command. He stated that Udom stole the appointment letter of a former immigration officer who had died and altered some information to reflect the currency of the situation, including altering the man’s name to that of Magdalene. He said, “Udom promised to give employment to Magdalene. He gave fake employment letter with a forged signature of one Sylvester Johnson, as an offer of immigration job to Magdalene. “Our officers were able to track him down and he is with us. We intend to send him to Abuja for further investigation. “It may also interest you to know that Udom had collected N270,000 from Magdalene’s father for immigration and N230,000 for a job in ExxonMobil from the same man. He is a serial fraudster. He has confessed to us. He stated that recruitment into NIS had started, adding that the process was through online. He explained that upon successfully completing the online form, a Personal Identification Number would be issued to each applicant for participation in the online examination. Udom, however, said somebody collected the money with a promised to get a job for the lady. “When the family started disturbing me and the person that collected the money refused to pick my calls, I prepared the employment letter for Magdalene. “One of my church members gave me that letter for me to pray for him; the person is dead, he was working in NIS,” he said. 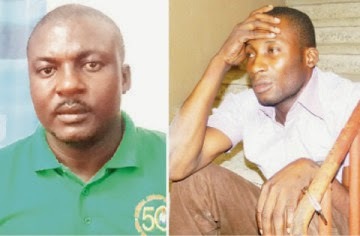 Yahoo Boy Arrested In Abuja: Internet Fraudster Who Lures Women From Internet To Hotels, Drugs & Rapes Them Nabbed! Iznt it a bit poetic dat d first guy had chosen 2 dupe ppl wit Nigeria Prisons Service appointments? Now he himslf wil get an appointment, but only as an inmate. Fraudulent men would alwz use dis situation in Nigeria 2 swindle ppl a fortune. A frnd of mine had been a victim, but he later recoverd d money wit d help of d police. Even som genuine job offers would require d recipient 2 part wit som good amount of money. I wonda wen dis trend would wash away. Let Nigerians think mor of wat they could do 4 demselvs 2 survive, &not wat d coun3 shd do 4 dem. Ppl in PH & environ may tune in 2 Love FM 97.7Hz on Wednesdays, 8:15am to listen 2 good motivational talks frm Mr Kasarachi Innocent. Dis could giv dem d wisdm 2 start up somthn on their own, or, if they wish 2work 4 sombdy, make demselv mor employabl by doing a numba of things 2 hav beta chances.